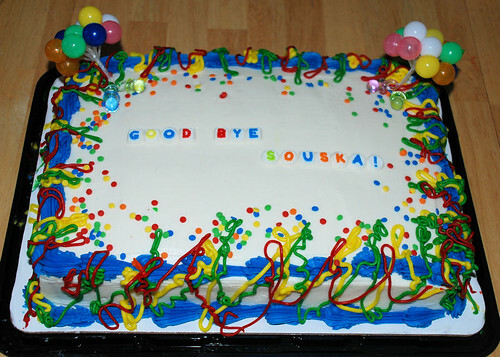 We had our good bye souska party today. It was as nervewracking for us as it was for the poor little guy. I suppose in the rush to make a memorable and final goodbye, the excitement carried us all away. I have a video of our little ceremony, but it’s not on youtube yet, but I can embed later. We had our cake, decorated with balloons and pacis complements of AC Moore and we whisked off to our favorite playground where we sent the souskas into outer space to help the alien mommies quiet their babies. The three of us were jittery all night from the experience, but despite some tears, T made it to sleep in an hour. Whew! Ta-dah! I looked all over for tiny ballons and pacifiers. I don’t think that anyone cared but me! So, enjoy my artistry! He looks so sad! 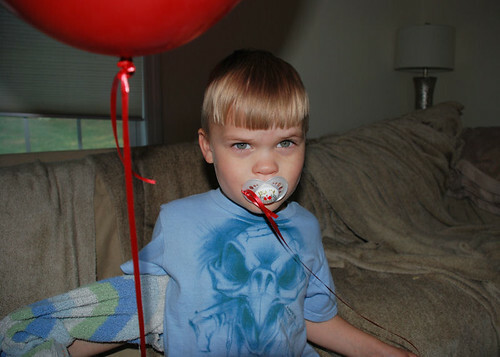 Moments before he was running around with the souska in his mouth dragging the red balloon all over. This is the last picture of him with Souska. And probably the last picture of him with a haircut by mom. Maybe he’s really sad over his bangs? 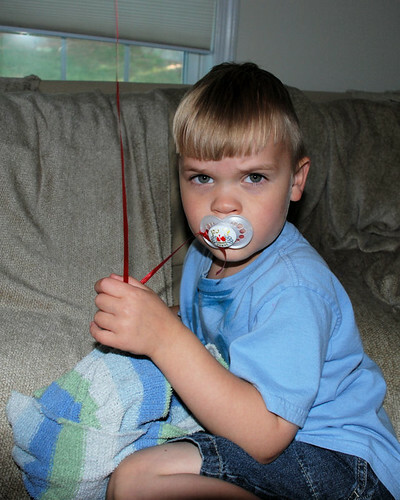 Jun 29 2010 Sep 18 2015 Lori D.
You had a paci! Cool! My mom was an rabid anti-pacifier activist. Her Quaker mother was also. They believed pacifiers were for “lazy” parents. Egor’s Mom used a paci for his first year and always gave Tyoma one when we weren’t looking. It helped to sooth him. Mom eventually changed her mind. Some kids need the extra soothing, others don’t. I would have loved a paci–faithfully sucked on my finger till I was seven. It was little more than a long skinny pacifier! I can’t see anything wrong with pacifiers. I was very reluctant to give up mine, that’s why my parents played the little trick on me (I still remember the pleasant sensation in my gums chewing on it;-) Lazy parents has nothing to do with. Which parents would want to put up with constantly beeing chewed on? I don’t think I believed that one second. It was a big whole, so it would have been fairly difficult to not notice it if I had chewed that myself. So it was a bit of a shocking mystery although I did not initially suspect that my parents had made the whole. I strongly do not recommend parent to try to trick their kids, it can undermine their credibility when the kids eventually figure it out. I really like the ritual you did here… It is honest, it shows respect and it is colourful and memorable… lovely. I am with you on the trick part. I can’t bring myself to lie about the tooth fairy or Santa Claus. I remember my parents let me believe in Santa, but they did so in a responsible way. Still, when I figured it out, I thought “Why would anyone make up a story like that to fool children?” My intellect was offended. I totally agree and I like your attitude.